Washington University in St. Louis recently expanded its Olin Business School on the Danforth Campus. The project included construction of two new buildings — Knight Hall and Bauer Hall — that are united by a soaring, three-story glass atrium. The atrium roof is supported by two elliptical pipe trusses, with one part a rolled roof and the lower part a sloped roof, all attaching to the elliptical trusses. 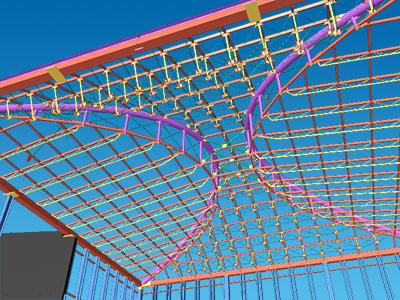 Nicoloff Detailing of Edwardsville, Illinois, detailed the atrium roof, wall and curved stairs of the atrium using SDS/2. To read more about this unique atrium roof structure, check out the August 2014 issue of Structure magazine.